A gift: a special gift, a gift which communicates a showing of love, appreciation, and acknowledgement. Calligraphy: hand lettering, a form of expression, a communication that is both Art and Message. Unlike many gifts, a gift of Calligraphy is a thought put into permanence by the artistry of Calligraphy turning the message into Art. Calligraphy takes both “the meaning in the words” plus “the beauty in the hand lettered style/colors” and turns it into a physical object ready for giving. The expression “Suitable for Framing” applies even more when the objects being framed are words which have special meaning for the lucky recipient. Thoughts from an event, a friendship, a love… The hand lettering makes it personal, more human, a gift of both art and message. Susan D (Yelp) I found Adrienne Keats through the Golden Gate Mothers' Group several years ago. 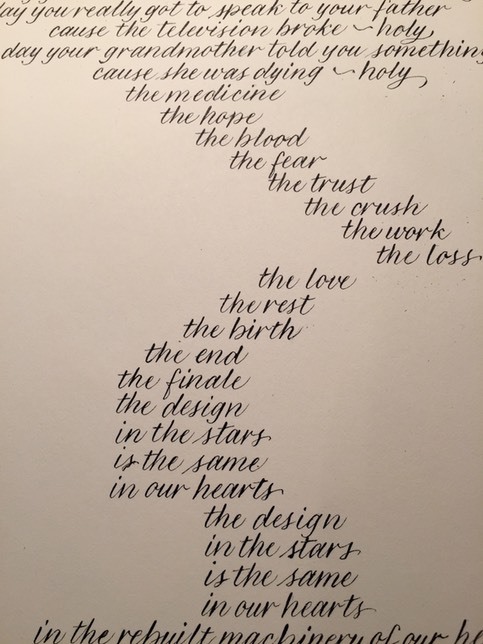 I wanted my favorite poem to be written out in calligraphy. She did such an amazing job and the piece is so beautiful, I absolutely treasure it. Since then she has done about 8 more pieces for me, including a beautiful Hebrew blessing for my nephew. Knowing that my sister-in-law is orthodox, she went to extra lengths to make sure the blessing was written correctly. The most recent piece is so lovely, it actually took my breath away. The thoughtfulness and artistry of her work is rare. Adrienne makes each piece special, from holiday cards and return address stamps to focus pieces for the home. I sometimes have to bring either my kindergarten age or 2 yr old child to pick up finished work or consult with Adrienne on a future piece. Unlike some high-end specialty vendors Adrienne is always kind and understanding with my children, even encourages bringing them. Overall, her work is unsurpassed in quality. I HIGHLY recommend Adrienne Keats. Of notable difference in this unique personalized gift is the adding of a three dimensional object, i.e. “the swing” itself. 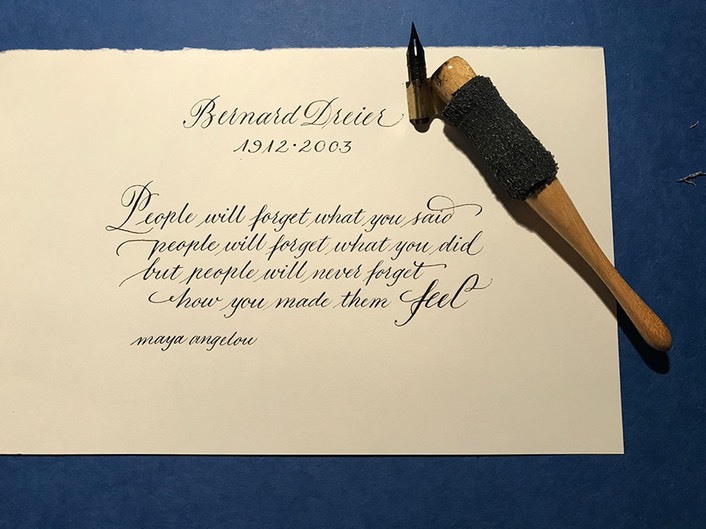 This is an example of the client working with her San Francisco Calligrapher, Adrienne Keats, to bring the “Act of showing Appreciation” to a higher level. When Adrienne took on the project she thought outside box of "traditional two dimensional Calligraphic framed gift/announcements”. 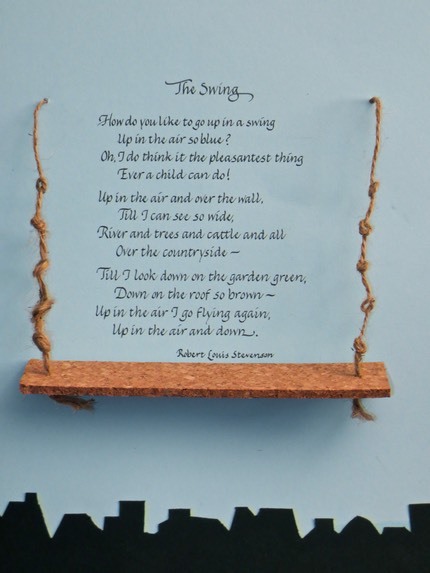 Adrienne hand crafted a physical Swing, attached it to the piece, and created a most unqiue three dimensional Calligraphic gift. Success, and another San Francisco Bay Area Calligraphy client pleased with the delivery of a unqiue and beautiful Calligraphic gift. Event: Wedding at Burning Man. This Poem was prepared and read to the couple and then presented as a gift. Event: First Anniversary: Paper The 1st Anniversary is celebrated with a paper gift. 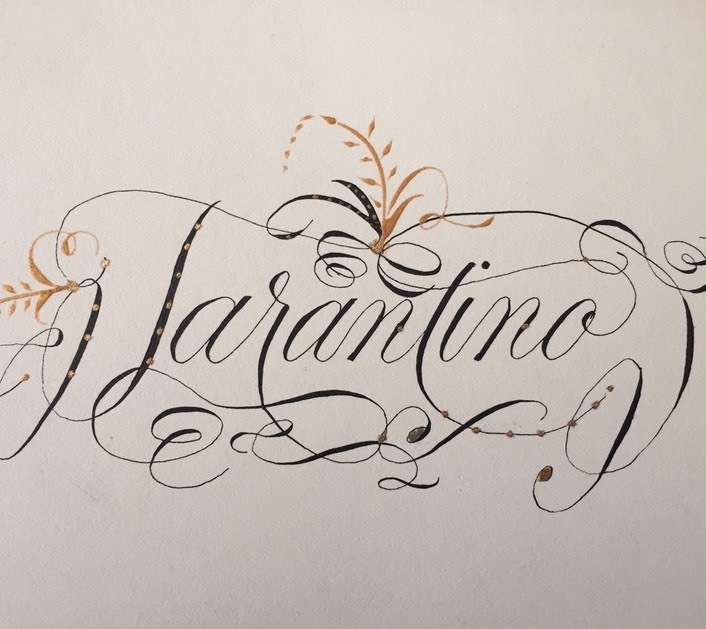 Using flourishing with a Copperplate base, this name was created for that purpose. Calligraphy is one of the mediums best suited for this.